Slate Magazine published something remarkable this week - and I'm not referring to the drivel about you being evil for wanting to give your kid the best education available. No, in this case, remarkable is a good thing. 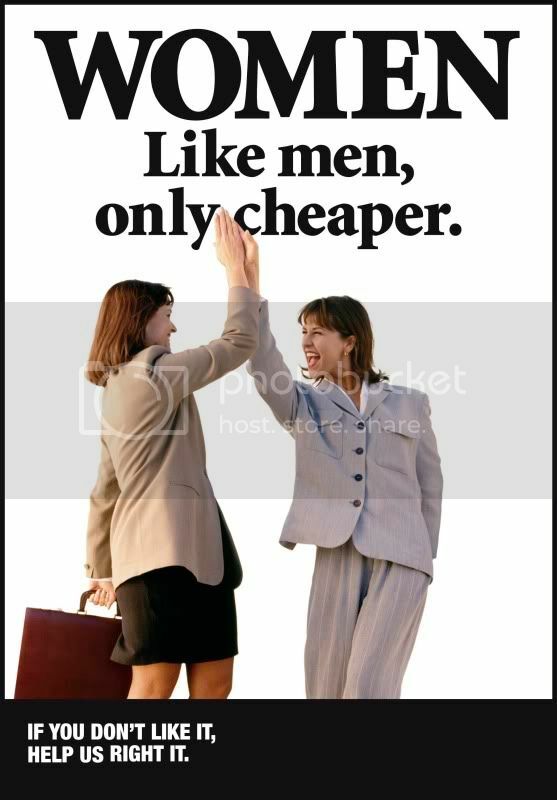 On Friday, they actually ran an article by Hanna Rosin called The Gender Wage Gap Lie, with this subtitle: "You know that 'women make 77 cents to every man’s dollar' line you’ve heard a hundred times? It’s not true." How many times have you heard that “women are paid 77 cents on the dollar for doing the same work as men”? Barack Obama said it during his last campaign. Women’s groups say it every April 9, which is Equal Pay Day. In preparation for Labor Day, a group protesting outside Macy’s this week repeated it, too, holding up signs and sending out press releases saying “women make $.77 to every dollar men make on the job.” I’ve heard the line enough times that I feel the need to set the record straight: It’s not true. It seems quite obvious that we should be comparing hourly wage or average weekly wages, as opposed to median salary. After all, there are so many variables that affect median salary - average time off taken, education levels, overall number of hours worked - all of which vary widely between the genders. Of course, this doesn't fit the narrative that a certain segment of the population needs some sort of regulatory intervention to be protected from those big bad men unfairly making more than them, but I digress. Rosin notes that when you compare weekly average wages and normalize for a 40 hour work week, the wage gap narrows to 87%. Rosin wraps up the article by speculating, as other economists have, that women simply make different career choices than men. Combined with the career interruptions that are far more common among women than men during the child bearing years, it intuitively makes sense that lifetime earnings and median wage will be lower for women - and it's not gender discrimination causing it. In the end, she says, "And in that more complicated discussion, you have to leave room at least for the option of choice—that women just don’t want to work the same way men do." Slate Magazine, advocating for rational career choices by women. What's next, freedom of choice in education? Thanks for the article. That 77% statistic is my pet peeve. People use the lie to promote victimization, which is good for the promoter and nobody else. So much for a mandate. As President Obama heads into his celebrated, historic and transformational second term, the American people are distinctly distrustful of the government over which he presides.For the first time ever, a majority of the public says that the federal government threatens their personal rights and freedoms. The Pew Research Center found that 53 percent of Americans view the feds as a threat while only 43 percent disagree. When President Obama came to office, he promised that government would solve all kinds of problems. The economy would boom, war would end, and the scourge of crabgrass would never again despoil suburban lawns.Progressive believers never doubted that Washington could merely snap its fingers and the infinitely complex global economy would snap to attention. Even the ocean levels would obey President Canute.